As the early web technologies have improved, innovation has flourished from open source academic roots. Many of the common web tools people use daily like email, social networks and online shopping all have origins in shared core open principles and material. There are now lots of programmes and apps that all (or should) essentially help do the same thing. Make our lives easier or to provide fun or give us more time to do the important things. So here’s the odd thing (at least one of them) – Not being able to find something in the web. 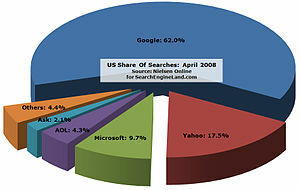 The graph here shows The share of search volumes the bigger search engines had back in 2008. There was though a time when Google didn’t exist and the corresponding intelligence of the day was which companies were dominant players based on giving access to the internet, Internet Service Provision. They controlled what they let you see on of the internet. AOL has a huge market share. The real value of deep research depends on how much you need an answer the works. During one of my first ‘proper paid projects’ I was asked to add a search engine to a website so people who did eventually find the site could then find what they were looking for. It was a novel but logical idea given that many customers at the time wanted one or two pages at most, just in case the internet did take off. Here however was someone who had thousands of pages of useful information to share but people couldn’t find what they wanted easily if at all – but again all of the information was there – and so began my research into how things were found in (not on) the web and the web technologies that made it possible. Back then as there wasn’t an app for that I’d cobble together freely available code from here and there to get something working but very quickly there were easier quicker ways to do the same thing as different groups and demands came to the market and software companies started answering the call for a better way to do something or to do something differently. An improvement in one bit of software generally meant something else needed updating and then came competition from new and emerging technologies and forks in software development, it’s been an interesting time since 1996. While programming is essential and I’d learnt to hack code to get something working, programming was moving too fast, I’d never keep up but at least I knew where it would be in the future. My earliest research showed that because there are common principles on which the web was founded the web was only heading one way – in the right direction as far as I was (and still am) concerned. It’s what people would do with the web that was and sill is always a concern. The plain fact was, if the mathematicians and the statisticians could get enough data to analyse using the first phase of language processing software, eventually they could teach computers to understand the meaning of things. Once computers could understand a thing it could then see if the original thing was related to or could be used by another thing to improve something somewhere else. It was labelled by some as ‘smart computing technology’. From a very high level viewpoint I could see that major investment of time and funding was being pumped into a number of related technologies that were going to converge at some point in the future, but the research also showed it would be cheaper, easier and more profitable to wait for their collective power to mesh. With a limited budget you have to wait – well I did, partly, if you accept that more borrowing isn’t the solution. You see you still have to keep your finger on the pulse of what’s happening to the flow of data. So what’s all this got to do with beta testing? Five or so years ago I was playing around with a search algorithm in some test software that I think was linked to a proposed way of filtering data to improve find – not search. I was looking for something that linked two ends to my middle so to speak. Where was the missing link. I knew what I wanted, I knew when I wanted to do something but what were the best options to do it? Was anyone working on the missing piece to my find puzzle? I wish I could remember what the search terms I used in my filters were (or even my filter settings) but I eventually got a warm positive lead after lots of fun tweaking. Here apparently was a site that held a key to solving an almost impossible problem. I was more than happy to investigate and delve deeper. Oh boy what a find! Imagine how I felt five years ago. I knew that just building websites and commerce platforms to compete in Google and other search engines was not really the holy grail for small business owners who wanted to find customers through search engine optimisation, yes it kept your bills paid but what was more important was having the right people finding the right site at the right time, all of the time. And a better solution was just round the corner. Battling in the search engines were and for a while yet still will be current and necessary because essentially there was only one working search technology. Only they had the power to sort through all the crap out there and give you the best options as they see the web. You can spend lots of money and time trying to influence search results but in the longer term the internet we’ve got started as research for the ‘find and filter technology’ that was part of what was coming next. So back on the beta testing topic … five years ago when I found that site that had the seemingly impossible answer that web commerce needed, I met (not physically) a small group of people with a set of ethical principles and software that had the power to influence (or subject to budget dominate) any web marketplace you choose to enter online, if you had all of the other pieces of the supply chain in play. A bit more of the history for a sec – From a programming view point there would always be the need to use multiple modules to perform any task. A blog for example is lots of modules that fit together in a framework that obey the rules of the web, there are core modules that need to be there and there are other modules that when chained together offer customisation capabilities. If all of the modules speak the same language you can bolt bigger blocks of modules together. Five years ago things didn’t work together very well, managing all of the programs that run or controlled anything in any business was time consuming. Apparently … the site I found was the closest match that would help me link up and control all of my web modules throughout the whole of the commerce supply chain. I’m really proud that I get to beta test new evolutions and my head has been flitting in and out of test mode for about the last week or two. I love the beta simplicity for planning and blueprinting. Wow wow wow. It’s a good feeling to know that some people still believe in quality and take the time to invite people to help make things work simpler and slicker. As expected there have been bugs to be found and dealt with, some are fixed, there are a few in the queue to do. Some cause annoyance but nothing breaks or can wait a while and some still need looking at but on the whole things are ready to roll out in to the first phase of pre release. I can’t think of any one in the commerce supply chain who won’t see the benefit to them or their business at one or more levels of operation once they have it at their finger tips. Sure there’s always the risk if you skimp on your learning or initial web based research and you don’t fill in the blanks as you go but in general the facts stack up in your favour following the process through to conclusion. Learn the basics, grasp the reasoning, start and finish step one, learn about step two, start and finish step two. Four stages in all. In many respects I think its fair to say that secret-name-technology 🙂 will open the door and change the future for any business or brand when used correctly while working with the web. I’ll try to add some pictures in my next post and make it shorter 🙂 Where’s my cup of coffee cup gone? What next if you are in business? Go watch :) It’s ingenious once you know how. How simple do you want it? This entry was posted in Work With The Web and tagged business intelligence research, commerce supply chain, statistical probability, web research technology on August 20, 2011 by Kevin Polley.